With vehicle details so we can help ensure this part fits your vehicle - we aim to respond within 2 working hours. Same day dispatch if ordered before 3:30pm! TALBOT EXPRESS 2.0 Starter Motor 82 to 94 XN1TA Remy. 206.0 / 22.0 mm. 0 986 010 200, 0986010200, 0 001 208 507, 0001208507, BX1020, 0 001 208 211, 0001208211, 9 000 331 702, 9000331702, 0 986 010 201, 0986010201. 25-0102, 25-0451, 250451, 25-0102, 250102. 8EA 725 981-001, 8EA725981001, 8EA725981-001, 8EA 726 100-001, 8EA726100001, 8EA726100-001. 11130245, 11123375, AZF3543, AZF3518, 11130375. 433223NO, 533002A, 618077, 6189, 6240, D8E76, D9E54, 433223, 533002, 534050, 618795, 6190A, D8E124, D9E36, D9E9, 455721, 534046A, 618565, 6190, D8E122, D9E27, D9E62, 453016, 534046, 618078, 6189A, 6242, D8E96, D9E61. 555807 555893 558007 558093 580193 580194 580195 580207 580216 580220 580255 580269 580281 580282 580291 5802P5 7910004942 7910027938 91502621 9150475180 9151139080 91511392 91511531 91519260 91519261 9153695080 95607233. CITROËN C25 Box (280_, 290_) 1.8. CITROËN C25 Box (280_, 290_) 2.0. CITROËN C25 Box (280_, 290_) 2.0 4x4. CITROËN C25 Box (280_, 290_) 2.0 E. CITROËN C25 Bus (280_, 290_) 1.8. CITROËN C25 Bus (280_, 290_) 1.8 E.
CITROËN C25 Bus (280_, 290_) 2.0. CITROËN C25 Bus (280_, 290_) 2.0 E. CITROËN C25 Platform/Chassis (280_, 290_) 1.8 E. CITROËN C25 Platform/Chassis (280_, 290_) 2.0. FIAT DUCATO Box (280_) 1.8. FIAT DUCATO Box (280_) 2.0. FIAT DUCATO Box (290_) 2.0. FIAT DUCATO Panorama (280_) 1.8. FIAT DUCATO Panorama (280_) 2.0. FIAT DUCATO Panorama (290_) 2.0. FIAT DUCATO Panorama (290_) 2.0 4x4. FIAT DUCATO Platform/Chassis (280_) 2.0. FIAT DUCATO Platform/Chassis (290_) 2.0. FIAT DUCATO Platform/Chassis (290_) 2.0 4x4. FIAT TALENTO Box (290_) 2.0 (290U4). FIAT TALENTO Bus (290_) 2.0 (290UEH4). FIAT TALENTO Platform/Chassis (290_) 2.0 (290UA4). PEUGEOT 504 (A_, M_) 1.8. PEUGEOT 504 (A_, M_) 1.8 (A01, A03). PEUGEOT 504 (A_, M_) 1.8 (M03). PEUGEOT 504 (A_, M_) 1.8 Injection (A02). PEUGEOT 504 (A_, M_) 2.0. PEUGEOT 504 (A_, M_) 2.0 (A1, A13, MY1, MY3). PEUGEOT 504 (A_, M_) 2.0 TI (A12, A14). PEUGEOT 504 Break (D_, F_) 1.8 (F01, E01). 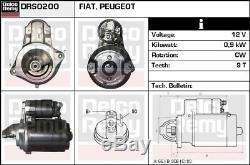 PEUGEOT 504 Break (D_, F_) 2.0 (D11, F11). PEUGEOT 504 Convertible 2.0. PEUGEOT 504 Coupe 2.0. PEUGEOT 505 (551A) 1.8. PEUGEOT 505 (551A) 2.0. PEUGEOT 505 Break (551D) 2.0. PEUGEOT J5 Box (280L) 1.8. PEUGEOT J5 Box (280L) 2.0. PEUGEOT J5 Box (290L) 1.8. PEUGEOT J5 Box (290L) 2.0. PEUGEOT J5 Bus (280P) 2.0. PEUGEOT J5 Bus (290P) 2.0. PEUGEOT J5 Platform/Chassis (280L) 2.0. PEUGEOT J5 Platform/Chassis (290L) 2.0. TALBOT EXPRESS 1000 -1500 Bus 1.8. TALBOT EXPRESS 1000 -1500 Bus 2.0. TALBOT EXPRESS 1000 -1500 Platform/Chassis 2.0. TALBOT EXPRESS 1000 -1800 Van 1.8. TALBOT EXPRESS 1000 -1800 Van 2.0. The item "TALBOT EXPRESS 2.0 Starter Motor 82 to 94 XN1TA Remy Genuine Quality Replacement" is in sale since Wednesday, November 15, 2017. This item is in the category "Vehicle Parts & Accessories\Car Parts\Electrical Components\Starter Motors".